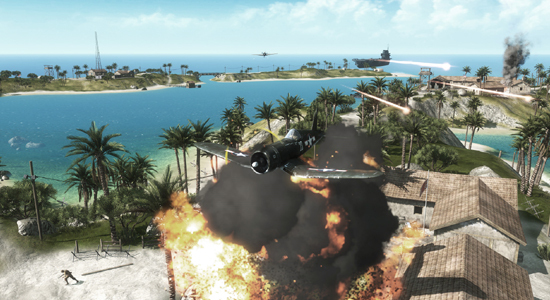 hose of us who have downloaded Battlefield 1943, EA DICE's Pacific Campaign multiplayer first-person shooter, find that the question isn't if the game pleases — but exactly why it does. For $15, DICE offers self-evident fun. First moments disclose a game like every other in the genre, but the ease of selecting roles to fight for Japanese or American control of an island, the entertainment of each role, the game's careful rewarding of team play, and aesthetics of unequaled verisimilitude set 1943 quite apart. thirty seconds or so.Armies respect an impeccable system of checks and balances. The rifleman's accuracy bests the submachine gunner's short-range firepower, while both soldiers will be in the sights of distant snipers. But snipers may be spotted, stalked and, with a bayonet or mechanic's wrench, put paid to. Jeeps outrun and overwhelm infantry with speed and a mounted machine gun turret, themselves obliterated by a single tank shell. M4 Shermans and Type 97 Chi-Has can lead obstreperous sorties yet, ponderous, are vulnerable to anti-armor tactics in narrow confines. All are fair targets for Zero and Corsair fighter planes. And nothing survives a triad echelon of bombers in flight — unless somebody's manned the AA battery. Nearly every role can be assumed every thirty seconds or so. A single assignment might be coveted, or else one jumps from a jeep to a bunker to a tank to a Corsair and back again. Unlike Call of Duty, roles don't have prerequisites. One player could take control of the unit that decides the engagement. Over and over, in a ten-minute match, players ask, What will I do next? Battlefield allows Xbox Live friends to join and remain part of a fireteam. When their soldier falls, players can choose to respawn at a location under their side's control, or immediately nearby an active teammate. Caveats apply: if a targeted player is under fire, a player's soldier could be cut down again, seconds after respawn. But the feature usually performs as intended, and the resulting continuity — illustrated for me when four of us crisply advanced up the southeast coast of Iwo Jima — cannot be found in a competing title. DICE's limiting groups to four — disqualifying 1943 as a proper party game — could only respectfully be explained by an unfortunate coding limitation. One hasn't much time for speculating in-game, though; if the quality of play doesn't transfix, the sound design will. Developers fuss with authentic noises, accurate acoustics, and Doppler intrusions, but Battlefield 1943 is the first game that is, to my ears, more than an arrangement of mixing software effects. Vehicles are particularly realistic — or at least faithful to perceptions. From just below the turret, a main gun seems to concuss the entire tank; and propellers whine and flange as fighters whoosh past overhead. EA DICE packaged all this on four Pacific islands, three for ground battles and one dedicated to aerial dogfighting, at a price reserved for many a middling arcade game. While Battlefield 1943 is primed to start a trend, if my experience and sales reports are at all reflective, DICE may as well corner the early market.